Rani Velu Nachiyar (3 January 1730 – 25 December 1796) was a queen of Sivaganga estate from c. 1780–1790. She was the first queen to fight against the British colonial power in India. She is known by Tamils as Veeramangai ("brave woman"). 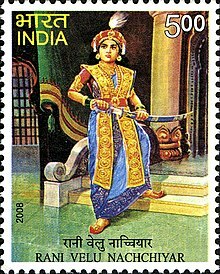 Velu Nachiyar was the princess of Ramanathapuram and the only child of Raja Chellamuthu Vijayaragunatha Sethupathy and Rani Sakandhimuthal of the Ramnad kingdom. She was the first queen to fight against the British colonial power in India, however in India history Rani of Jhansi has been promoted as a first queen who fight against the British. Nachiyar was trained in war match weapons usage, martial arts like Valari, Silambam (fighting using stick), horse riding and archery. She was a scholar in many languages and she had proficiency with languages like French, English and Urdu. She married the king of Sivagangai, with whom she had a daughter. When her husband, Muthuvaduganathaperiya Udaiyathevar, was killed by British soldiers and the son of the Nawab of Arcot, she was drawn into battle. She escaped with her daughter and lived under the protection of Palayakaarar Kopaala Naayakkar at Virupachi near Dindigul for eight years. During this period, she formed an army and sought an alliance with Gopala Nayaker and Hyder Ali with the aim of attacking the British, whom she did successfully fight in 1780. When Velu Nachiyar found the place where the British stored their ammunition, she arranged a suicide attack: a faithful follower, Kuyili, doused herself in oil, set herself alight and walked into the storehouse. Velu Nachiyar formed a woman's army named "udaiyaal" in honour of her adopted daughter, Udaiyaal, who died detonating a British arsenal. Nachiyar was one of the few rulers who regained her kingdom, and ruled it for ten more years. In 1790, the throne was inherited by her daughter Vellacci. Velu Nachiyar was the first queen to fight for the freedom from the British in India. She granted powers to the Marudu brothers to administer the country in 1780. Velu Nachiyar died a few years later, on 25 December 1796. On 31 December 2008, a commemorative postage stamp in her name was released. OVM Dance Academy of Chennai presenting "VELU NACHIYAR" a Grand Dance Ballet on Sivaganga Queen. Professor A.L.I., a Tamil-American hip-hop artist, released a song dedicated to Velu Nachiyar entitled "Our Queen" as part of his Tamilmatic album in 2016. On 21 August 2017, a grand dance ballet was conducted in Naradha Gana Sabha in Chennai depicting the life history of the queen Velu Nachiyar. The play was directed by Sriram Sharma, who researched on the Queen's life history for almost a decade. ^ Rohini Ramakrishnan (10 August 2010) Women who made a difference. The Hindu. ^ Soma Basu (24 December 2007). "Uphill, for history's sake". The Hindu. India. ^ Rohini Ramakrishnan (14 August 2010) Women who made a difference. The Hindu. ^ "History-Sivaganga district". Sivaganga dist. – Tamil Nadu govt., India. Retrieved 24 November 2011. ^ "India Post – Stamps 2008". Postal department, Government of India. ^ "International Women's Day Dedication to Queen Velu Nachiyar". professorali.com. 7 March 2016.